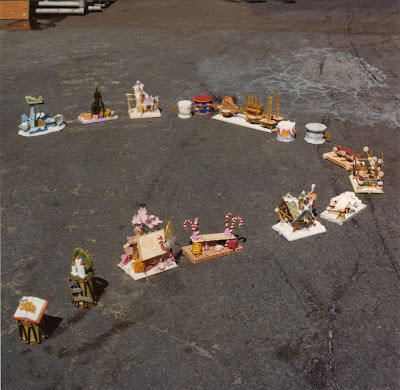 Scale models for Disneyland's Very Merry Christmas Parade, lined up backstage, 1977. 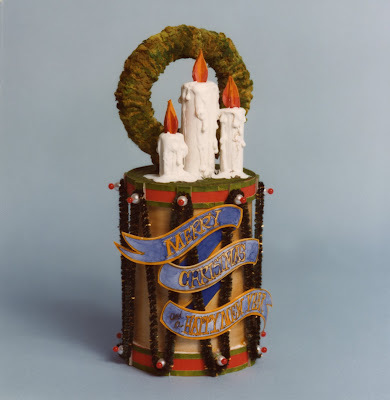 It was the most wonderful time of the year, and the year was 1977. I was eleven, in the 5th grade, and finally man enough to see my first non-"G" rated movie, Star Wars with my Dad! Our family spent the Christmas holiday at my grandparents' house in California, and on December 27, we all went to Disneyland together. That day we stood in front of Main Street's Penny Arcade to see the Park's newest holiday spectacle, The Very Merry Christmas. 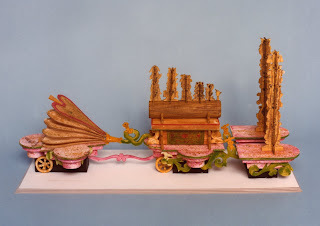 With its pop-up book floats, glockenspiel girls, and, yes, silly reindeer, my imagination was inspired! 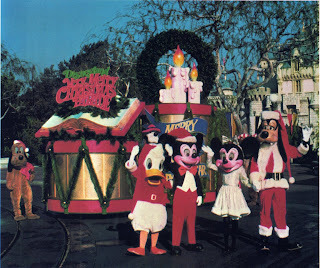 A decade later, I became a Disneyland parade designer myself, and I never forgot the enchantment I felt with my family that December day in 1977. 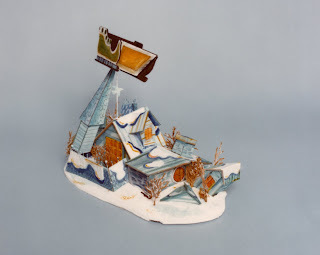 ...including the original hand-made models for 1977's Very Merry Christmas Parade! 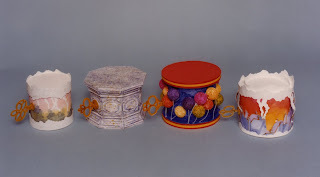 At the time, these 3/4 inch-scale works of art were still in marvelous shape, and I photographed them all for reference. 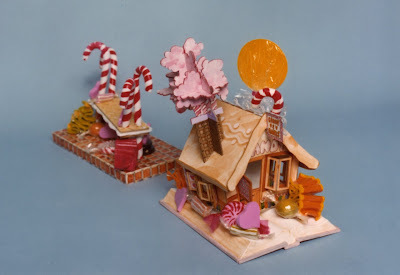 The iconic Gingerbread house popping out of an open-book would become the symbol of the parade, its image appeared in advertising and on tickets. 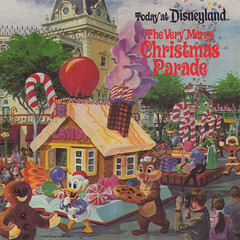 In the final parade, Chip and Dale busied themselves making sweets at the candy kitchen table, while surrounded by happy, dancing gingerbread cookie people. At the North Pole Post Office, letters are pouring in from children around the world, all addressed to Old Saint Nick, himself. Meanwhile on the workshop float, toys of all kinds are being manufactured. 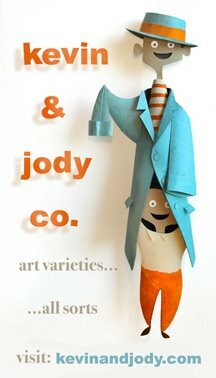 This toy factory is actually made of toys! These drum units were rolling stages for various characters and dancers, and were also packed with speakers for the parade's musical soundtrack. Make sure to click on all these photos to appreciate the details. Some of these environments seem empty without the performers. Here is an implied cottage for the Seven Dwarfs. Grumpy played the pipe organ, while Dopey pumped the giant air bellows. Incidentally, this seems to be the spot in the parade where I recall the newest Disney animated characters made their appearance. I had seen the film The Rescuers earlier that summer and I was totally obsessed with it - even more than Star Wars, I have to admit. 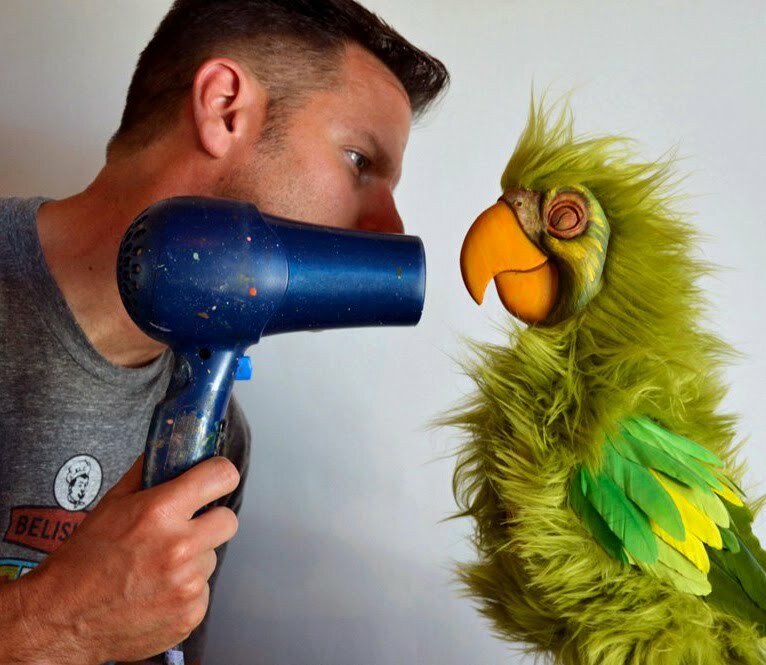 Orville the albatross was my favorite character in the movie, and the Park costume was a nice interpretation. Evinrude the dragonfly looked pretty strange to me as a kid, though, with his huge eyes and shapely feminine legs. Nevertheless, I loved them all. 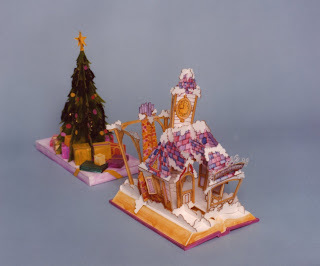 Disney characters of all kinds, including Pooh, Tigger, the Three Pigs and the Big Bad Wolf, appeared with this unit, carrying prop gifts and decorating the Christmas Tree. Snowmen and Snowladies bopped along behind. And finally, Santa! Led by his team of reindeer, and surrounded by the famous Disneyland "Glock Girls" Santa wished everyone "a very merry Christmas" from his sleigh above a landscape of snowy rooftops! If you'd like to see a GREAT BIG photograph of this very float in the final 1977 parade, check out "Disney on Parole's" fascinating blog here! To all of you who follow this blog throughout the year, thanks! I hope it's been as enjoyable for you, as it's been for me putting it together. Here's wishing you a very merry 2009! And more merriment to come! that is not really want I wanted to say though. i wanted to say that the serendipity of your life is entirely sweet. i keep coming back here not really because of the disney artifacts (though they are WAY cool) but because I find it so moving that your work and art and life are so full circle, and it is a lovely thing to see in a person. Wow! Talk about a trip down memory lane! This was my first parade at the park. It's amazing the thing we keep. Thank god you had the foresight to photograph all these. Thanks Kevin for taking me back to happy times. These are fantastic... thank goodness you had the foresight to take these pictures! I realize that Disney can't save *everything*, they'd need a zillion warehouses just to store stuff. 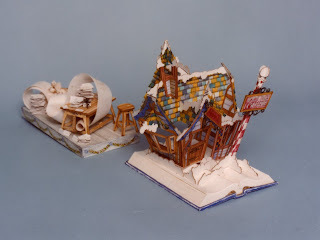 But it is a shame to us theme park fans, knowing that these beautiful models were destroyed. Happy New Year to you, Kevin, and thanks for your enthusiasm and wonderful posts! 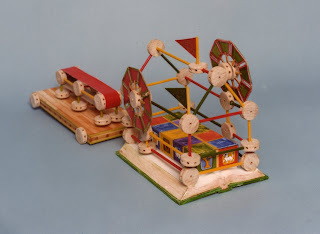 Ever the historian - great that you thought to photograph those models back then, and as always, thanks for sharing your priceless collection! I am glad that you were able to record these images. Wow, I finally get to see some of 'The Rescuers' - I was obsessed with it too back then, only difference was I never got to go to a Disney park as a child - so appreciate the photo of the characters! Thanks! Hey there. I was a thrift store here in Phoenix and bought an old audio cassette on the Disneyland label which appears to be a custom-made item "RJ-playbacks." When I it got home to play it I saw that the words GLOX GIRLS had been written on the face of the cassette. It was obviously a home-made recording by someone working at Disney -a group of women, presumably, based on the way the gave their names (and in some instances their home addresses). From what I deduce now, with the help of your blog, the cassette was recorded by a coterie of the Glockenspiel Girls [GLOX GIRLS] for the benefit of the actor playing Santa. Does this seem like a plausible scenario? Hi Kevin - loved this post, as I too miss the silly reindeer. However, I would swear I saw them in Florida this year on the broadcast of the uber commercial Christmas Parade?? Could it be that this herd is still pulling Jolly Old Saint Nick's sleigh in WDW? That would give me hope that some day, they might return to DL. I am thankful though, that the Rope Holders at the end of Disneyland's Christmas Fantasy parade still wear very similar costumes to the Glock Girls, including the wigs. This year when I watched the parade, after the reindeer passed me by, and not a single deer winked or licked me, seeing these Glock-less girls, in their red skirts & black boots with white fur trim, helped bring about the spirit of the season! - The photo of the Rescuers Character Unit is priceless! 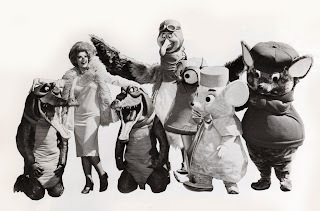 I never saw Evinrude, Medusa, or the gators in the Park, but I do remeber seeing parts of an Evinrude costume in the Character Headroom circa 1986 (along with a Shaggy DA costume), when they were doing a purge. Sadly, I don't think there's a chance we'll see Evinrude parading down Main Street USA again.